Born into a wealthy French family, Jacques-Henri Lartigue (1894–1986) began to photograph at the age of six. With instruction from his father, also an amateur photographer, young Lartigue, like so many others of the time, photographed what was immediately at hand and of the greatest importance to him—his family and friends at play. His exuberant photographs depict his parents, brother, cousins, friends, nanny, and servants pursuing the pastimes of an affluent and active family at the dawn of the twentieth century: running, jumping, and swimming; racing soapbox cars; and flying kites, gliders, and airplanes. In his teenage years Lartigue turned his attention to fashionable French society, making numerous photographs in the golden years of the belle epoque of Parisian women as they paraded in their finery along the city’s boulevards, in the Bois de Boulogne, or at sporting events. World War I put an end to these activities, and in 1915 Lartigue himself also refocused his priorities and began to study painting; thereafter he continued to pursue both painting and photography. Lartigue’s photographs made before World War I are charming, vivid, and unpretentious, but they are not unschooled. Curious and inventive, Lartigue was an avid photographer who experimented with a wide variety of sophisticated cameras, seeking those that were light, easy to handle, and able to capture things in motion. He also studied the photographs used in illustrated newspapers and magazines, especially those on sports, and even had a few of his youthful attempts published in these journals. Lartigue’s photographs made at the turn of the century received little attention until the early 1960s, when Charles Rado of the Rapho agency saw some examples. He was so moved by them that he showed them to John Szarkowski, director of the department of photography at the Museum of Modern Art, who was equally impressed by what he saw. In 1963 Szarkowski mounted an exhibition of modern prints made from Lartigue’s original negatives at the Museum of Modern Art. With their seemingly casual style, creative use of often abrupt cropping, and celebration of the beauty of both the vernacular and the speed of modern life, Lartigue’s photographs perfectly suited an aesthetic for photography that Szarkowski was promoting at the time. The Museum of Modern Art exhibition, coupled with an article on Lartigue in Life later that same year, secured his reputation, and in the years before his death, he began to reprint his earlier work. Yet vintage prints made by Lartigue of his most celebrated early photographs from the early 1900s are very rare. Thus, Bouboutte, Rouzat, 1908, is an extremely important addition to the Gallery’s collection. 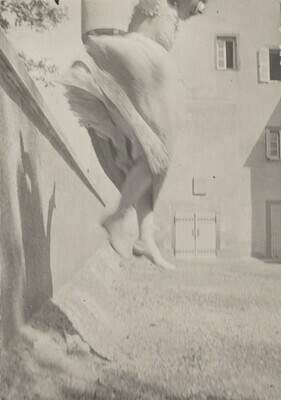 Showing the artist's cousin leaping off a wall, it succinctly captures not only the creative, dynamic energy of Lartigue’s early work but also the young century’s fascination with movement and speed. Collection de Jacques et Florette Lartigue; Donation Jacques Henri Lartigue, Ministere de la Culture France; NGA purchase (through Howard Greenberg Gallery, New York), 2010. A New Paradise at Howard Greenberg Gallery, New York, 11 September - 24 October 2009. Goldberg, Vicki. Jacques-Henri Lartigue, Photographer. New York: New York Graphic Society/Bulfinch, 1998.